Give your skin a break from the aggressions of the sun, urban life and pollution, with a regular facial treatment. It usually starts with a deep cleansing of the skin to get rid of the toxins, followed by exfoliation to strip away dead cells, then a mask specific to your skin and treatment, finally a gentle face massage to stimulate the blood flow and cream hydratation to nourish your skin. This beauty treatment for your face improves both your look and your outlook. The treatment is a fusion of cleansing, toning, gentle scrubbing, a facial mask and a massage that creates fresher, healthier and brighter skin. The end result is a younger, firmer, and lovelier face! Treat your skin (and yourself) to any of our amazing facial treatments. A treatment designed to soothe a sunburned face, restore freshness, correct uneven skin tone, comfort, calm redness and prolong the tan. 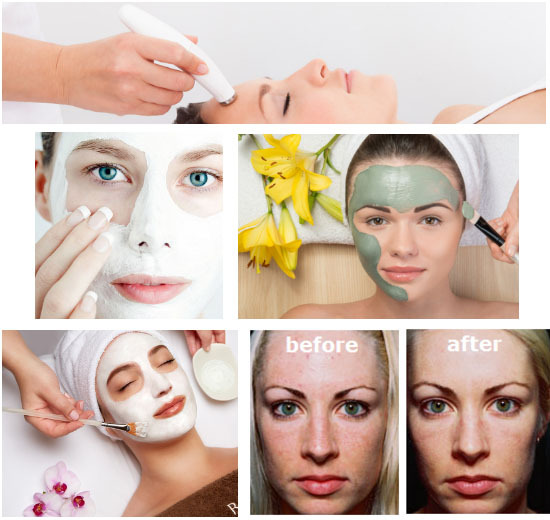 The treatment uses renowned products and includes: cleansing, toning, a gentle scrub, mask, and massage to revitalize, rehydrate and boost facial skin recovery to remove dead cells from the skin’s surface while encouraging cell renewal, this facial cleanses, exfoliates and hydrates while a facial massage relaxes facial features and energizes the skin healthier and brighter. Great for all skin types.